Consider These Options When Choosing a Size! We’ll soon have a special baby arriving so, of course, we’re looking at baby quilt patterns. But, what’s the best size? The short answer is that a baby quilt can be any size you want it to be. However, it helps to consider how you expect the quilt to be used, and for how long. Babies grow fast so what’s perfect for a newborn will soon be too small. 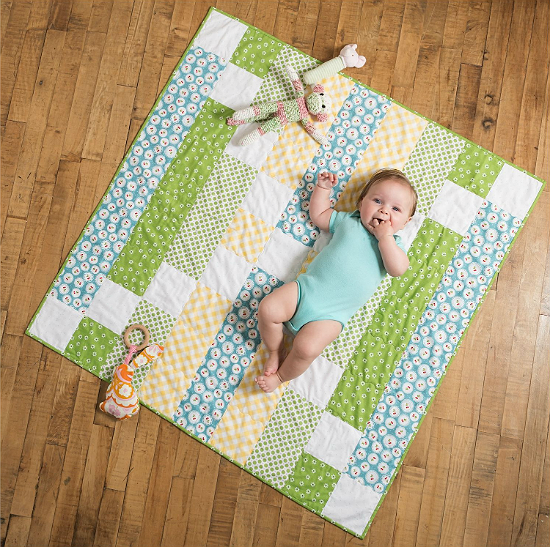 This baby quilt from AccuQuilt is 40 1/2″ x 40 1/2″. Plus, consider fabric usage, and especially the backing. Quilts over 42″ wide will likely need a pieced backing, so baby quilt patterns often stay under that limit. Claire has put together an informative article that considers the issues and recommends sizes for various uses. Click here for the “Does size matter? Helpful tips to choose ideal size for a baby quilt” article. Another good source of information is a thread on Quilting Board that starts with the question “Does anyone know the standard size for a crib quilt?” You’ll find a lot of good suggestions to consider from fellow quilters. Read it here. For newborns – 30″ x 30″, although 30″ x 40″ provides some growing room and is a nice rectangular shape. For a crib – 36″ x 52″, as crib mattresses are typically 28″ x 52″. 36″ square and larger is great for a play mat. After reading through the recommendations we decided on a 56″ x 56″ quilt. This allows plenty of room for mom and baby to snuggle under together, for nursing, story time and cuddles for a long time to come. 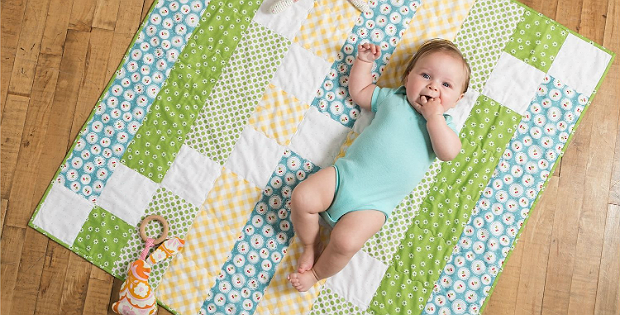 That’s an unorthodox choice, but as they say, we can make a baby quilt any size we want.